Almost every human being on the planet today knows something - and feels something - about America. It's the "land of the free and the home of the brave." It's responsible for hamburgers and Coca-Cola and color TV. It's the center of the universe, with the greatest athletes, tallest buildings, most famous movie stars, and biggest dreamers. But what does a world that contains seven billion people really think about the most talked about - and controversial - nation on earth? This is the question that inspired René Zografos to spend seven years interviewing people from seven continents to pen the definitive guide to the U.S.A.'s global reputation. 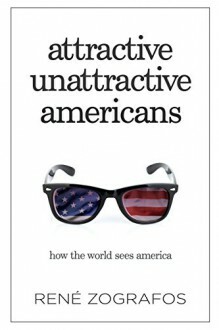 In ATTRACTIVE UNATTRACTIVE AMERICANS, Zografos - an award-winning Norwegian-Greek author of eight books and veteran journalist - brings together the voices of thousands of people from around the world to highlight their opinions of Americans and the country they live in. From Mexico-born 'Dog Whisperer' Cesar Millan and a Bangkok-based tailor named Marco, to American girl-obsessed Italian teenagers and Swedish ex-pats living in the U.S.A., Attractive Unattractive Americans is chock-full of hundreds of unexpected insights, opinions, compliments and criticisms about the so-called "greatest country on earth." It's a fascinating, not-to-be-missed exploration of culture, politics, philosophy, and the American Dream the likes of which has never before been seen in one place. Among the timely, unusual, and exceptionally entertaining questions ATTRACTIVE UNATTRACTIVE AMERICANS addresses include: · Are Americans liked or disliked when traveling abroad? · Do people from other countries actually care about what's going on in America? · Is American music, film, fashion, and food as influential as we think it is? · How do the great American cities actually stack up against the Hollywood portrayals of them? · Are Americans attractive? http://Randal.booklikes.com Randal 3.5 Surprising and Informative!